Over time, kitchen exhaust systems can get coated with a flammable, greasy build-up that can pose a significant fire hazard. Just because you are protected by an automatic fire suppression system doesn’t mean that you can ignore grease build-up in the exhaust system! While a fire suppression system discharge will put out a fire, it will also bring activities in your kitchen to a screeching halt, require cleanup and re-inspection, and cost you money. Investing in regular kitchen exhaust system cleaning can help you prevent a fire as well as keep you in compliance with California fire safety codes. 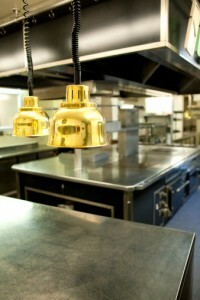 Here are some things to consider when choosing your kitchen exhaust system cleaning contractor. Getting your exhaust system cleaned by a professional is essential. You need a contractor who possesses the necessary state certifications as well as a high level of technical expertise. Flue Steam meets both of these requirements. We can provide you with “Certificate of Performance” stickers which will be accepted by your insurance company and by code inspectors as proof that you are keeping up with your cleaning obligations. As members of IKECA (International Kitchen Exhaust Cleaning Association), Flue Steam is able to provide highly skilled technicians for your exhaust system cleaning needs. Our technicians have completed various certification courses through IKECA to provide them with the skills and expertise needed to utilize steam cleaning technology to clean your exhaust system from top to bottom. When you invest in a kitchen exhaust system cleaning, you obviously want to know you are getting your money’s worth. Try to choose a contractor that will be happy to offer you proof that their service works. For example, a contractor can use a tool called an IKECA Depth Gauge Comb in order to measure grease deposits before and after cleaning. Ideally, the comb should reveal that your grease deposits were at or above the danger level of 0.125” before cleaning, and down to the acceptable level of .002” after cleaning. When you hire a contractor who is able to take these measurements, you will also be able to tell if you need to increase the frequency of your cleanings to deal with rapid grease build-up. You also want to make sure that the cleaning is thorough. Some companies will just focus on the exhaust system hood, where grease is the most noticeable and the easiest to clean. Flue Steam can clean every inch of your system because we utilize steam cleaning. We will also clean and inspect roof fans, empty drip cups, and even install extra access panels in order to ensure that you receive the most thorough cleaning possible.